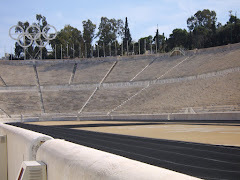 I'm a longtime critic of Olympic Villages. PyeongChang's Village team nailed it! 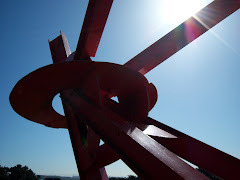 Since my first Games experience as an Atlanta Olympic Village housing coordinator/supervisor in 1996, I've looked at the housing areas with a manager's eye -- what works, what elements may remain in place as handed down from the Centennial Olympic Village, and what's new. 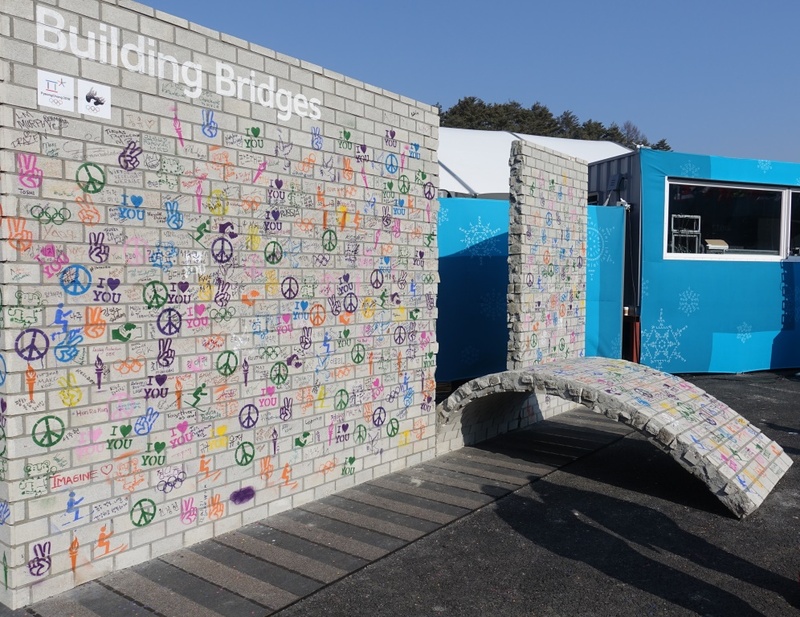 South Korea's housing area featured some of each. 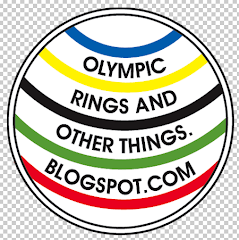 Some additional context on my critiques: Later five-ringed travels afforded a day pass or two to the athlete housing areas at six Olympiads. More specifically, in Sydney I was a pre-Games Village volunteer (will never forget meeting Aussie hero Dawn Fraser on the bus one day after a shift). 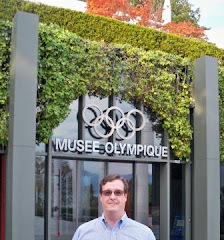 In Salt Lake I was just a visiting spectator (the director was a former Atlanta colleague), and later as an NOC guest it was fun visiting -- and critiquing -- the temporary homes of the Olympians in Beijing, Vancouver, London and Rio. Some Villages score on ambiance. 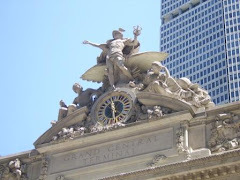 Others on efficiency. 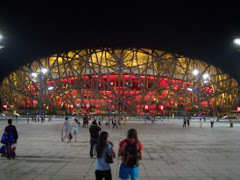 Some exude an Olympic electricity while others get the job done with measured fun. 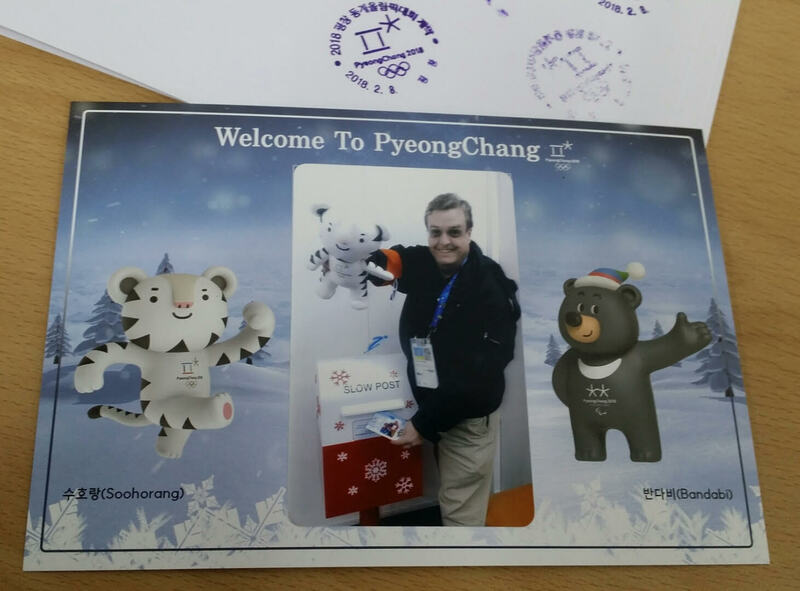 Visiting the PyeongChang 2018 Olympic Village today, for the first time as a credentialed reporter, was an amazing experience. 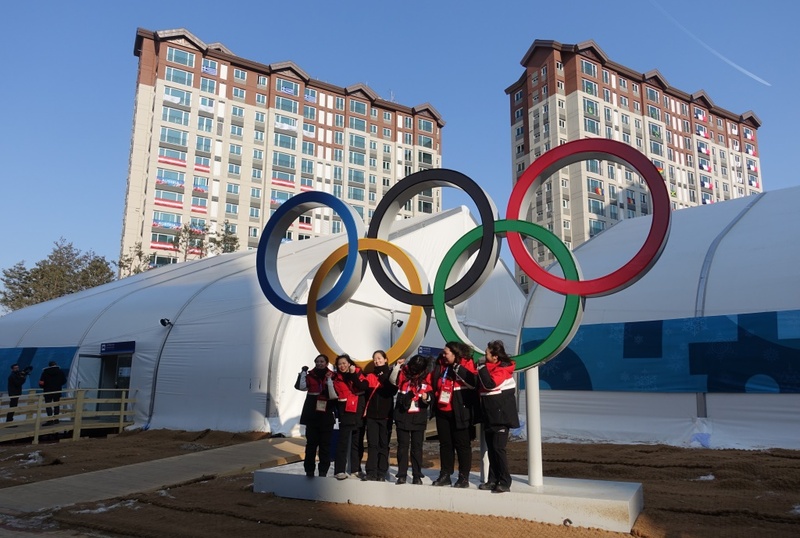 And the Korean village housing scored two big thumbs up from this blogger. 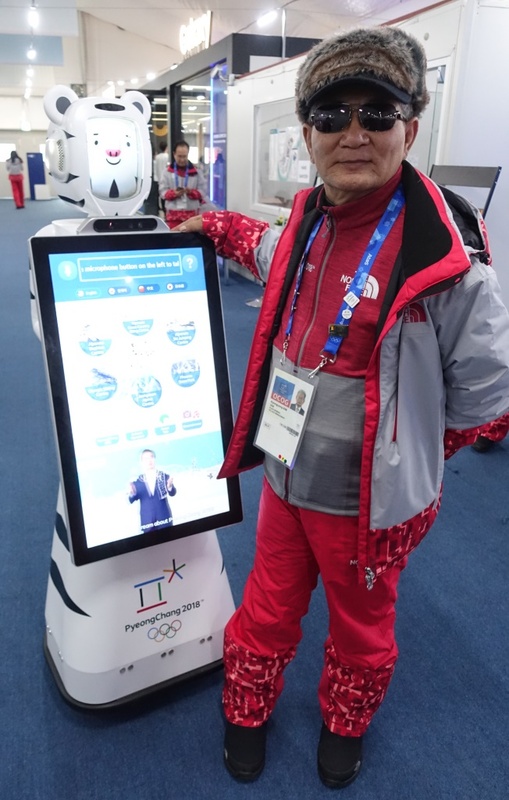 Here's a Olympic Village first: They have a robot! 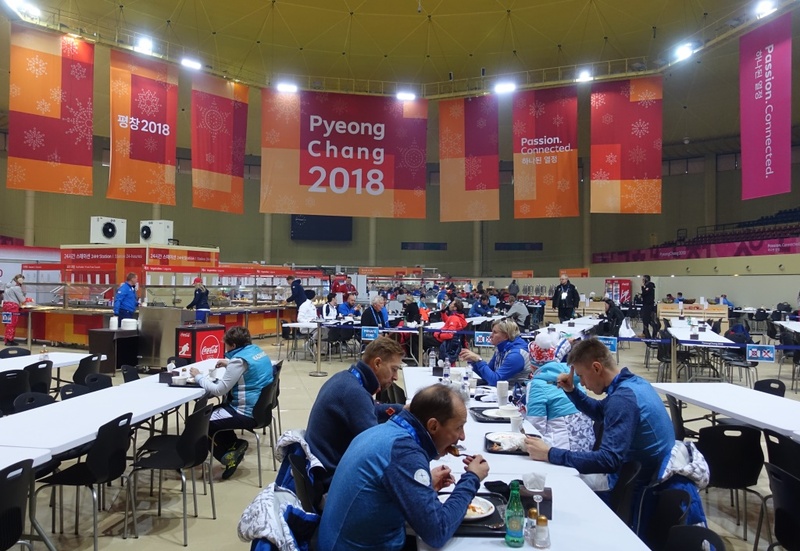 The PyeongChang Village near the mountain Alpensia venues sits along a river and in the foothills of a curving and wooded elevation, with about a dozen residential towers (600 rooms) close to a domed sports arena now serving thousands of meals per day as the main dining hall. 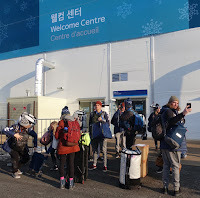 After passing through security screening with fellow journalists and athletes from Team GB, Slovenia, Turkey and Ghana (yes, Ghana has a skeleton athlete), the Village Welcome Center opened into an international plaza decked out with flags of all 95 competing nations. 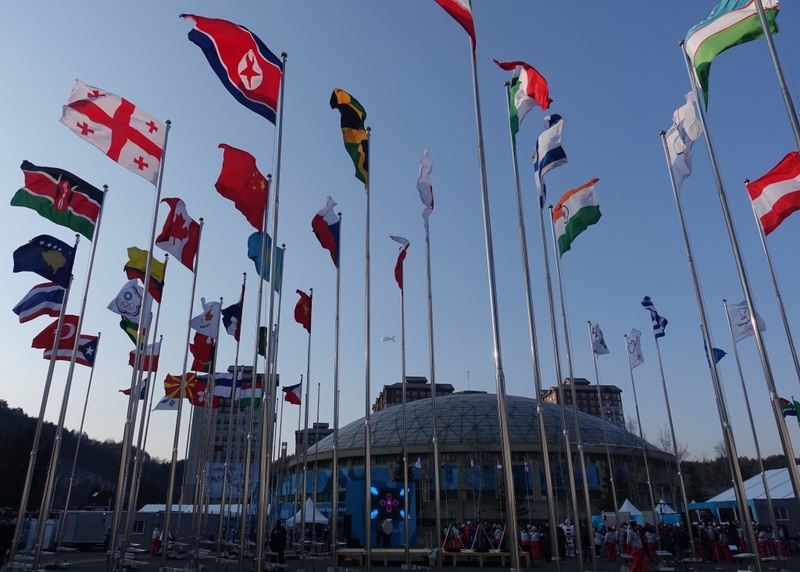 And, yes, the North Korean flag enjoys a spot of prominence near the Olympic and South Korean banners. 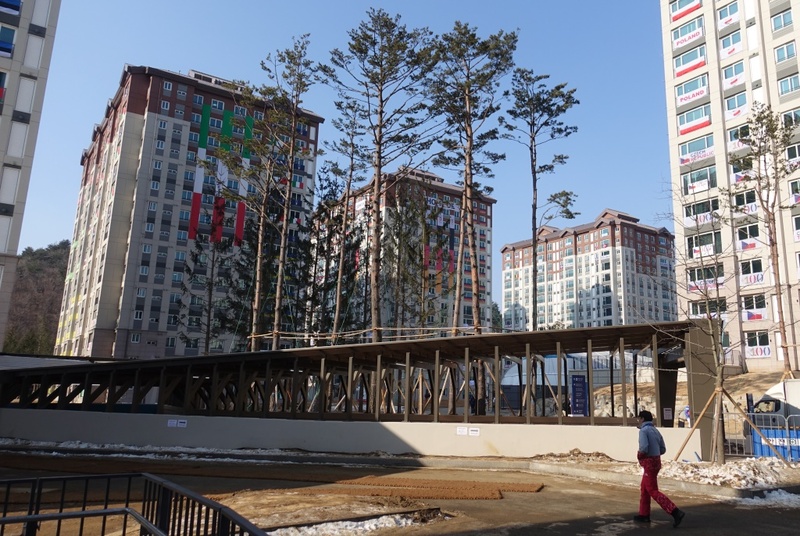 Olympic Villages consist of two main areas. 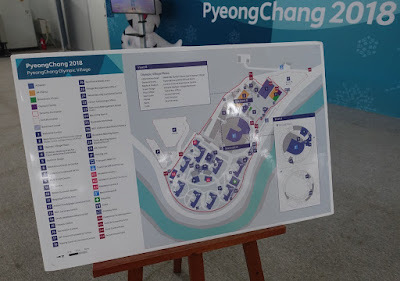 An International Zone featuring the team welcome ceremony stage, entertainment options and necessities like a post office, hair salon, general store and Olympic merchandise. 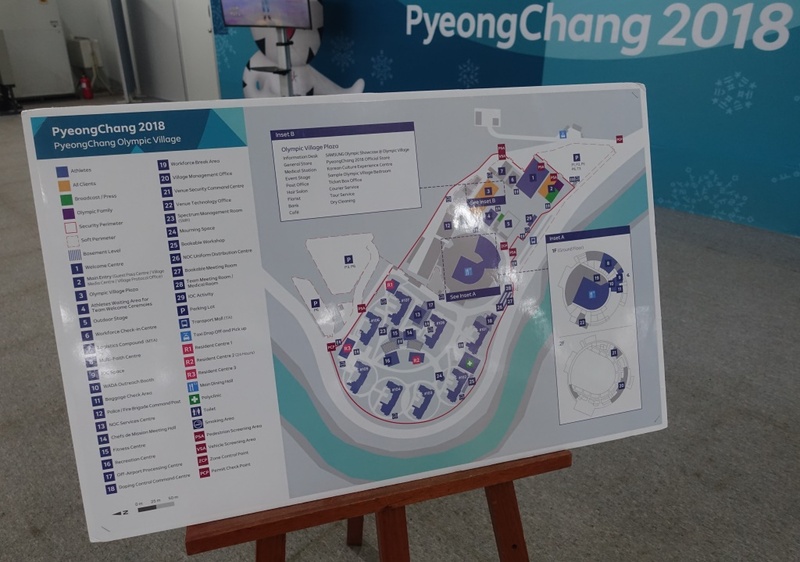 All of the services for PyeongChang's athlete village are nestled into on giant tent (I understand the coastal village at Gangneung, with its 922 rooms, is similar). 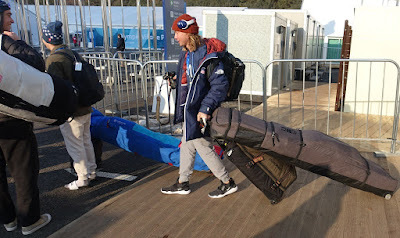 Usually the adjacent Residential Zone forbids non-athletes from visiting, but today media got a rare chance to roam freely across a few acres of the Village, affording me photo opps in an athlete game room (i.e. 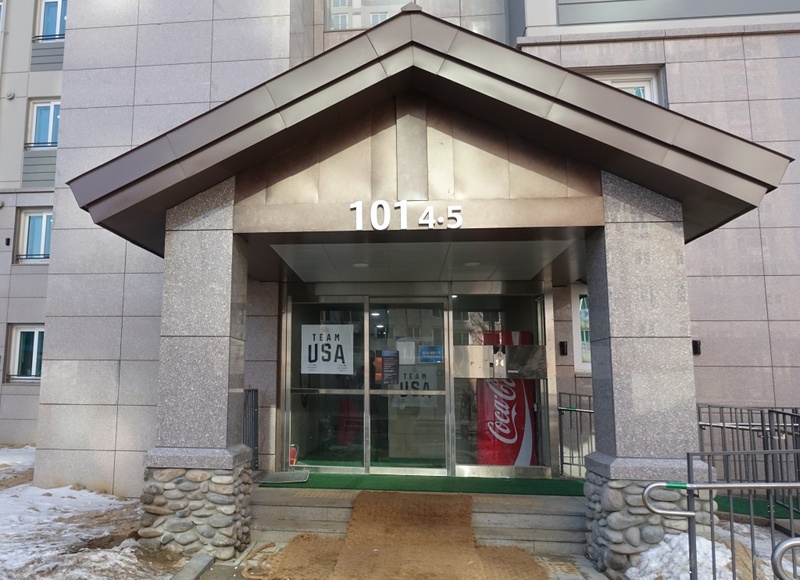 billiards, pinball), lavanderia (since athletes, too, have dirty laundry) and the entry to the tower housing Team USA (the only larger nation in PyeongChang that did not deck the exterior walls with patriotic banners). 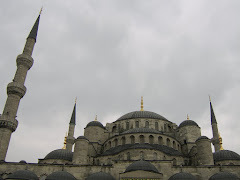 I attended a couple of the Welcoming Ceremonies during which the host nation officially celebrates each arriving nation. 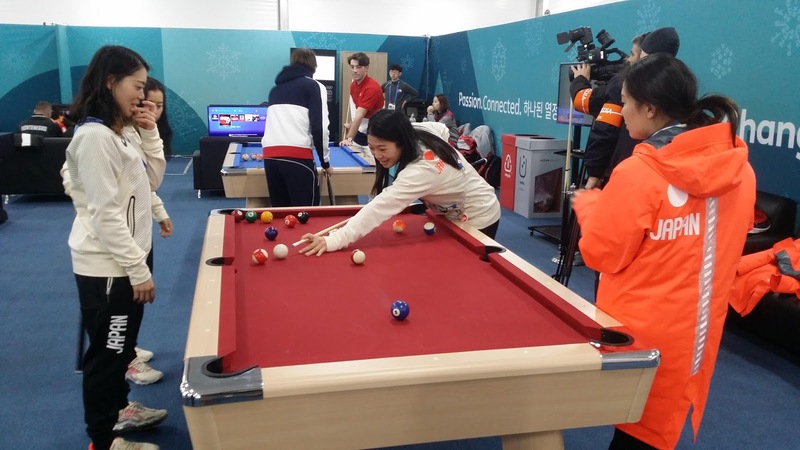 Today's entrants included a lone alpine ski athlete and HRH Henri Grand Duke of Luxembourg, who were down for some pin trading, as well as Turkey, Australia, Thailand and India. 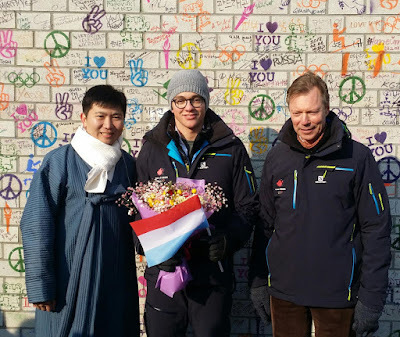 According to the first of two Olympic Athletes from Russia (OAR) competitors met today, their competitors are/were not permitted to create a team pin. Anyone got an egg timer to see how long it takes for bootleg OAR pins to show up on the scene? While enjoying the warmth of the retail areas, I stamped my passport with an Olympic Village post office postmark and enjoyed an introduction to an Ambassador of Morocco by IOC Member Ms. Nawal El Moutawkel, who asked me to share that her home nation will enjoy an African first: a shot at hosting a future Youth Olympic Games (she also requested a shout-out to her alma matter Iowa State University). 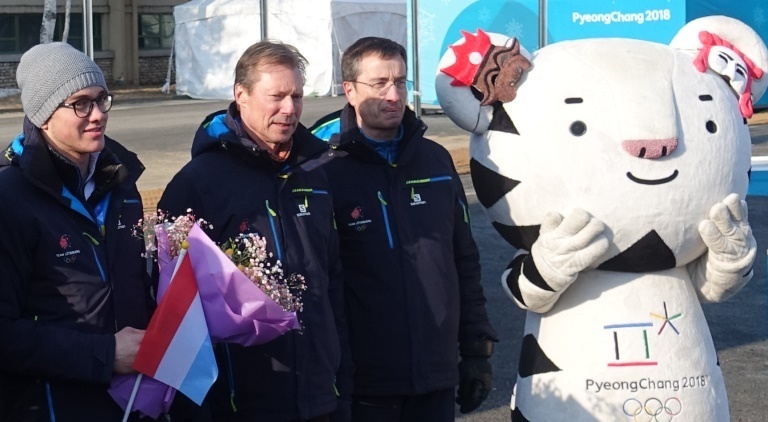 Pin trading was robust both outside and in the Village. It was fun running into fellow Olympin members Bud and Sid (and his wife) trading near the security entrance. I arrived with about 50 pocketed pins and ran out of trading material in less than 90 minutes of trekking the Village, coming home with coveted 2018 NOC pins from Ghana, Luxembourg, Netherlands, Nigeria, Uzbekistan, Austria, and Mongolia, among others, and even scored a special-design IOC snow globe pin for PyeongChang ... for the win! Most interesting conversations: short chats with arriving Team USA alpine and snowboard athletes checking in from their Seoul-to-PyeongChang bus ride. 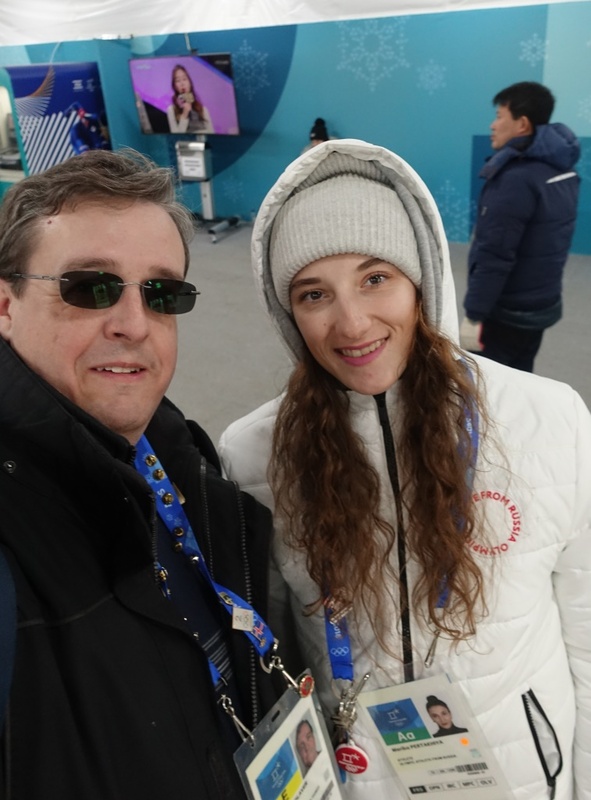 Everyone was all smiles, happy for the nomination of luge bronze medalist and four-time Olympian Erin Hamlin, who will carry the Stars and Stripes into the stadium tomorrow night. It's going to be a great Games!